Basseterre, St. Kitts, April 05, 2017 (SKNIS): Recipients of a three-month-long intensive training on combating crime in St. Kitts and Nevis, especially among young people, pledged to take a new path in life and showed appreciation to Dr. Neals Chitan, International Social Skills Consultant and Crime Reduction Specialist, during an anti-crime march and rally held in St. Kitts on Tuesday, April 04, at the Independence Square in Basseterre. The event, which heard persons shouting the rallying anti-crime cry “Stop ‘n’ Think before you proceed,” came as a result of the successful completion of a powerful social skills campaign that was launched at the Advanced Vocational Education Centre (AVEC) in January 2017. The project was designed to engage strategies to help individuals, families and communities, in the Federation avoid a number of destructive behaviours, including but not limited to, disrespectful confrontations; criminal and violent activities; and impulsive quick reactions. 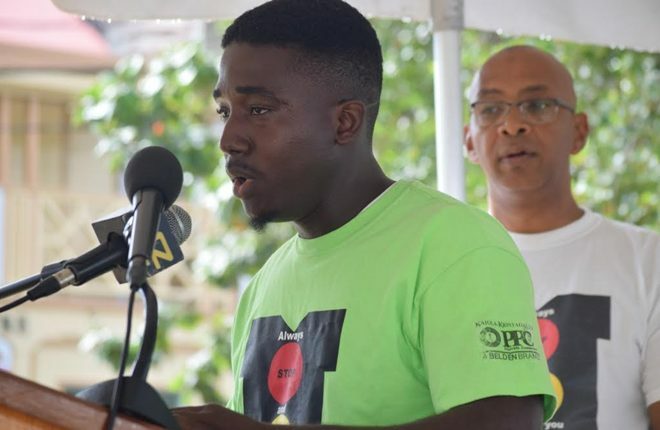 Speaking at the anti-crime rally, Andrew Mosquito, an AVEC student, reflected on the lessons imparted to him, while noting that they impacted him on both a personal and professional level. “Dr. Chitan’s presentations were nothing like I have experienced before. The most impressive part about his discussions was that he grasped everyone’s attention using only raw facts. 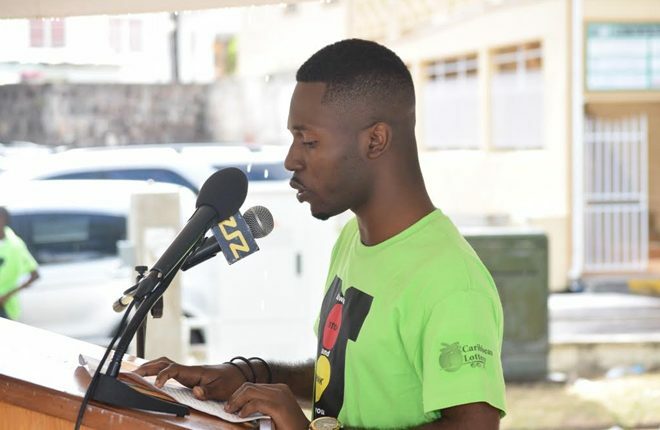 Over the last three months, his wealth of knowledge impacted me in a tremendous way, and the manner in which he broke down realistic situations opened my eyes on life experiences and allowed me to view reality from a different perspective,” said Mr. Mosquito. “Anxiously, I looked forward to attending his sessions because his interesting discussions aroused my curiosity for learning. I feel confident now that I can apply what I have learned to my-day-to day life,” he added. Mr. Mosquito described Dr. Chitan as brilliant and saluted him for his generosity in putting the programme together. “I know there is much more to learn from you so I am inviting you back to sit with us once again, for as a new leaf turns, there will be new students, fresh minds to teach and more eyes to be opened,” he said, addressing Dr. Chitan at yesterday’s rally. Kadeem Carty, also a student at AVEC, noted that Dr. Chitan was an exceptional teacher, as he made sure that no student was left behind. He added that Dr. Chitan took a step-by-step approach to ensure that persons understood life, how to go about it, and listened attentively to their impacting stories. Mr. Carty encouraged persons to stop and think before they act because doing anything impulsive could harm the country’s tourism product. Both young men paid recognition to Dr. Chitan for his commitment and dedication to crime-fighting. They extended thanks to him for believing in the students and being a positive role model in the lives of many. Approximately 308 students across St. Kitts who worked along with Dr. Chitan over the last 12 weeks will graduate on Saturday, April 08 and receive their Life Skills Achievement Certificates. With their certificates now in hand, they will be better equipped to make more informed decisions. 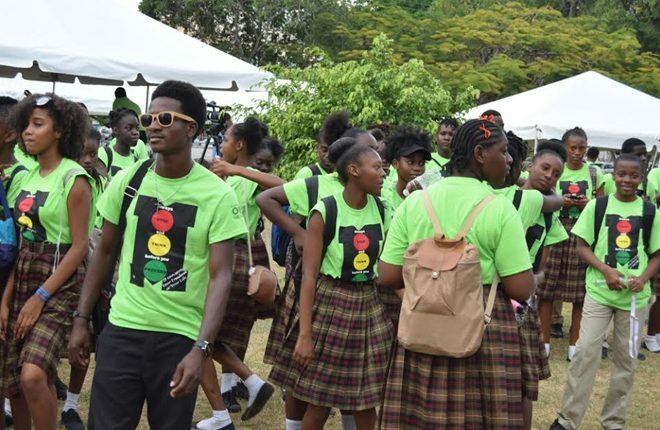 Similarly, a second march and rally is scheduled for Nevis on Thursday, April 06, starting at the Grell-Hull Stevens Netball Complex.